We changed the car recently. Nothing wild or extravagant, just a second hand car that was significantly less of a second hand car than the previous one was. It’s nice though. It’s nice to set out for someplace with some level of confidence that you might actually arrive there. I’m not what you would call a ‘car’ person. In fact, one of my odd focuses in those rare times when we do change cars is the kind of radio that it might come equipped with. I’m old enough to remember wishing the car would have a CD Player. I even remember wishing that a cassette player might come as standard. Hell, I even remember wishing for a radio that had push buttons rather than two twirly knobs. That’s old. With this new/old, car I had an updated wish for the radio. I wished that it might be possible to connect my classic ipod to the sound system via a cable so that I could listen to my podcasts over the speakers. Honestly, it was one of the first things I looked for. So, yay, I am happy to report that this feature does indeed exist. Now, when I set off on my long journeys, I can enjoy my podcasts with ease as I roll along. I’ve been doing it for a few weeks now and it’s great. Except something has been lost. Something really small and quite difficult to define. I’ll give it a go, though. You know me; always trying. Before I do, I just want to explain why I’m not going to tell you about the podcasts I listen to. Not today anyway. Podcasts, I feel, are a bit like underwear. You can reveal a little too much about yourself by describing in depth the type you use. With a reveal of your underwear, you can immediately be seen to be either the coolest dude on the block or the lame ‘tighty whitey’ doofus. So can it be with podcasts. So lets not go there today. I don’t feel up to it. But, yes, something has been lost. Let’s do that. Before my new Batmobile, I tended to listen to podcasts in three places. Firstly, when I go on specific ‘walking’ walks, I bring my beloved, still pristine, ipod classic along, I plug my earbuds in, and I ‘do’ my podcasts. Secondly, if I’m making dinner and there’s a bit of prep involved, I will again break out the ipod and buds and do me some listenin’. Generally, in this case, I put the ipod in my breast shirt pocket and go to work. Invariably, the earphone wires gets caught in chairs and pots and the buds get ripped out of my ears and I swear a lot such that my family thinks I hate making dinner but, apart from that, it’s good. Thirdly, and this is naughty I know, I used to listen in the car on long drives. I’ve done a lot of podcasts that way. I use both earbuds. When I’m driving. I know, I know, it’s just that the one ear thing winds me up. I’ve always been a bit of a sound junky and the one ear thing just doesn’t fly my balloon or float my boat or rattle my cage. Except I miss listening on my earbuds. Something has definitely been lost. Something I never really knew existed until it was gone. 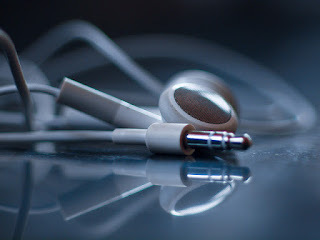 It’s a strange sort of intimacy to comes from listening with earphones wedged in your ear canal. The words and the voices all seem to land with an unfiltered purity in your brain. The tones and registers of the voices seem to tickle those tiny nerve endings that bring us our sounds. To go altogether too far, there is almost a sensual quality to listening to regular podcast stuff like this with earphones. And in the car, on the speakers… well, it’s just in the car, on the speakers. Do I make sense? I don’t know. The ease and convenience of the new/old car and its sound system means that earbud free driving will now be the norm and, in truth, there’s some sense of relief about that. I always felt I was doing wrong being totally plugged in, in the car. But I will now look forward even more intently to the long long walks and those chair-tangled kitchen earbud listens. I’m not a car person either, Ken. I recall when I bought the Talbot Samba someone in the office overhead I’d got a new car and asked me what kind. “A red one,” I replied with a straight face. I’ve owned four cars in my life, a Zephyr (Zodiac, I suppose), a Triumph something , a Vauxhall something and the Talbot Samba. The Triumph and the Vauxhall were both silver. I forget what colour the Zephyr was. I’ve not owned a car for over twenty years. Occasionally I miss it but never enough to go out and buy one. All cars ever do is break down. I can replace a type, check the oil and water and that’s about me despite coming top of the year in Applied Mechanics at school. I did like driving when I was younger. Quite often my kid sister would come over and we’d go for a drive. I liked that. That was our thing. We’d pick a direction on the map, somewhere we’d never been, and go investigate. I miss that. F. and I used to go for drives too only we’d tend go for daytrips. “What’s Dundee like?” No idea. Let’s go find out.” We didn’t much care for Dundee actually. I don’t think any of my cars even had a CD player. Tape players, yes, the kind that if you weren’t careful would chew up your favourite cassette. I loved turning the volume up when I was on my own. Nowadays all I seem to play is classical music and soundtracks. I kind of miss the rock music but it’s impossible to work over. It never used to be. Somehow I managed it when I was a teenager but that skill’s long been lost to me. A good few years ago Carrie bought me a iPod-thingy. I used it for a while but I lost interest. I don’t like things in my ears much and I’m too self-conscious to wear headphones; they’d look stupid under a flat cap. Even on longish bus trips I find I’m content with my own thoughts. I’ve never listened to a whole podcast that I can remember. I’d listened to my friends being interviewed but that’s about it. I don’t think I’ve even watched a whole TED talk or anything. Not sure why. I was never one for audio books either. Even TV these days has to work hard to hold my attention. Half the time I’ll sit there playing a word or number game on my tablet while the programme’s on. Being able to listen through the car was a big deal when I finally got to, but since I would then want to keep listening when I went into a store. So I just left the earbuds in and switched out the plug. Sounds dumb but it works. I leave my headphones on at work even if there is nothing playing. I get you!